A towering Qilin prepares to ritually enter a Chinese restaurant, bringing good luck in its wake. Birmingham’s Chinatown, Lunar New Year, 2012. Dr. Amos’ own research includes an excellent ethnographic study of a Qilin dance troupe in Hong Kong during the 1970s. Source: Chinatownology. Introduction: What is a Qilin and why do they dance? Let me start off by wishing everyone a happy New Year! Since multiple holidays fall on the same weekend this year, I am current away from the office visiting my parents. As such we will be dipping into the archives and taking a look at one of my favorite posts dealing with this season. The Lunar New Year is the longest and most important festival in the traditional Chinese calendar. Individuals celebrate it by spend time with their families, prepare special foods, sweep the house clean (tossing out the bad luck) and engage in various activities to invite good luck for the coming year. The New Year is also a busy time for many traditional martial arts schools throughout the Chinese cultural sphere. This is even true in the West. A number of these schools have Lion Dance teams that perform in public during holidays or other special occasions. These can often seen blessing homes and businesses and collecting red evalopes in return. Their “plucking of the greens” is considered to bring good luck, and often attracts a crowd of onlookers. There are a variety of rarer dance traditions that are also occasionally seen during the New Year. One that I am interested in is Qilin (unicorn) dances. These are most often found in Southern China or in the Chinese diaspora. They are also strongly associated with the Hakka ethnic minority who originally settled along the east branch of the Pearl River in Guangdong. Traditionally Hakka martial arts schools (including Southern Mantis, White Eyebrow and Dragon) were the most likely to sponsor Qilin dance companies. While this is the most common style of Qilin seen today, it is worth noting that some other unicorn dance traditions do exist. One set is said to have originated in Heibi (where it is still practiced), and another came from near Emei Shan. The village that practiced this form of Qilin dancing was displaced by a dam construction project in 1958 and was eventually resettled in Guangdong where they carry on their tradition today. 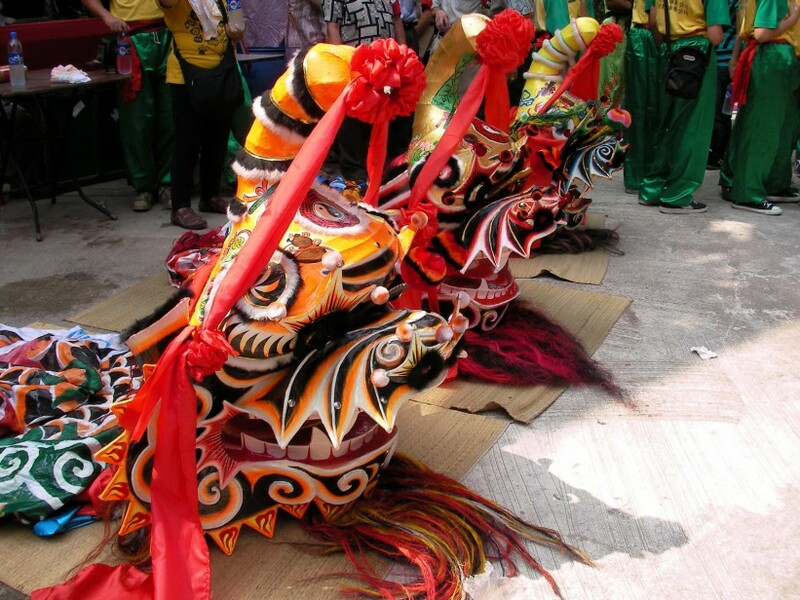 The basic form of the Qilin Dance and ritual is similar to the more commonly seen Lion Dance. A Qilin is danced by two individuals, usually a skilled martial artist who holds the heads, and a “younger kung fu brother” who holds the tail. The pattern of steps and gestures that the Qilin employs are different from what is seen in Lion Dancing. The music is also unique. In traditional dances Qilins were also more likely to enter a residence than were Lions, but now both can be seen indoors. Both types of animals are thought to bring good luck and can be used to conduct martial exorcisms. This ancient depiction of a Qilin was a guardian of the tomb of the Emperor Wu of Li Song (363-422). Note that this creature has both wings and paws. 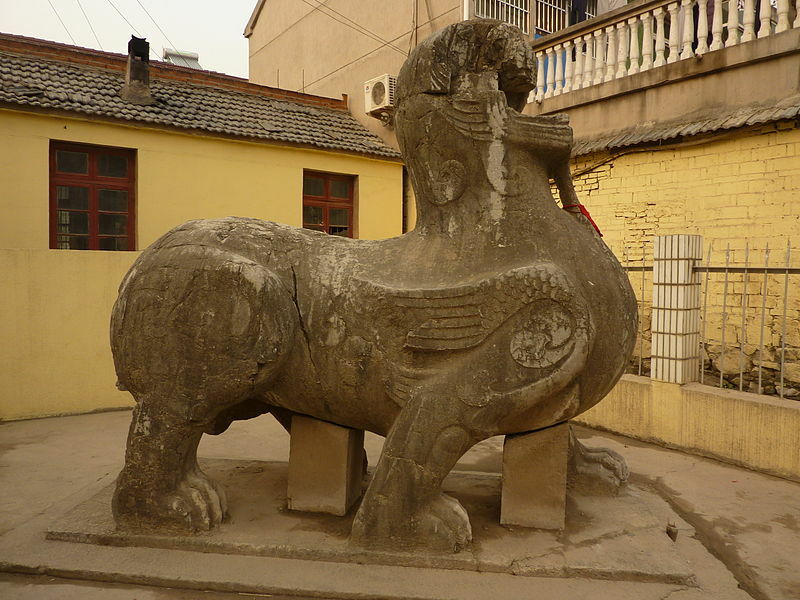 It more closely resembles a central Asian griffin than a later Chinese Qilin. Source: Wikimedia. But for readers who may not be deeply versed in Chinese mythology, what is a Qilin, and why would they appear in folk dances in the first place? 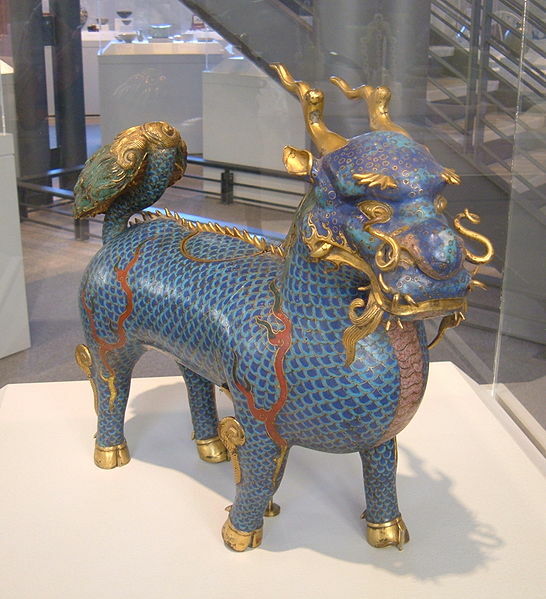 The Qilin is often referred to as the “Chinese unicorn,” though it has no relation to the mythological European creature. In fact, many of the qilins I have found portrayed in art do not even have a single horn. Instead they are often shown with two horns or none (these are often said to be “females”). Still, most Qilin dance heads do exhibit one horn, but so do southern style lions. As such the number of horns seems to be a poor indicator of whether a figure is a qilin or not. 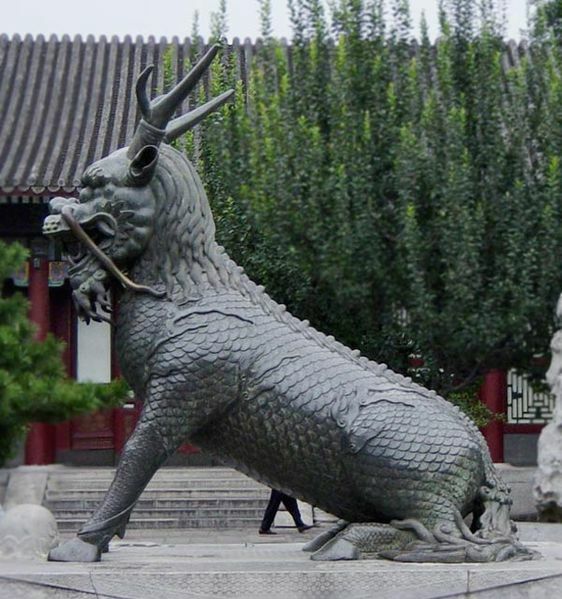 The actual shape and supposed nature of the Qilin has changed dramatically over the course of China’s history. In the ancient early imperial period (Qin dynasty) the Qilin was thought to be the most powerful of the four mythological creatures. In modern folklore it is held to be third, after the Dragon and the Phoenix but above the Tortoise. The Qilin is a chimera-like creature that is said to have the body of a deer, covered with the scales of fish, married to the head of a dragon, with the tale of an ox and the hooves of a horse. Historically the Qilin was identified with the African giraffe after live specimens were brought back to China by explores during the Ming dynasty. 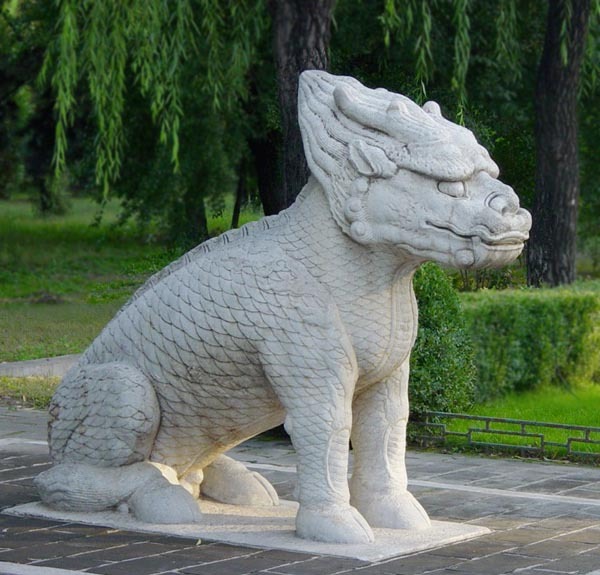 A statue of a Qilin preserved among the Ming Tombs. this creature shows distinctive dragon and fish characteristics and clearly has cloven hooves. Source: wikimedia. The Qilin is also thought to be a gentle creature that enjoys a vegetarian diet and takes so much care in its movements that it “does not disturb the grass when it walks.” Its sudden appearance is said to mark either the birth or the passing of a great sage. Traditionally many Chinese families would have been hoping for the birth a son who would go on to do great things in the New Year, so it made sense for the Qilin to become a seasonal creature. Qilins are also masters of luck and can bestow that luck upon others. This made them a popular symbol in some communities. These gentle animals were also far from helpless. They can project a force known as sha qi (lethal energy) and are quick to hunt down evil or wicked forces. This ability to project “martial qi” makes Qilin capable of performing the various sorts of exorcism that need to be carried out over the New Years. “Once there were severe droughts in China. Crops were dying, and the people faced starvation. Both the Earth Deity and Laughing Face Buddha discussed ways to solve the crisis. The Buddha knew that Qilin had the power to stop the disaster but did not know its whereabouts. Later, with the assistance of the Monkey God, they managed to find the Qilin’s cave. The Qilin agreed to help. Upon arrival on earth, it spat fire (sha qi) and bestowed ‘rui’ (meaning serenity or prosperity) upon the people. A Qilin shaped incense burner from early in the Qing dynasty (likely 1700s). Source:Wikimedia. One of the best accounts of intersection of Qilin dancing and Hakka martial culture can be found in the doctoral dissertation of Daniel Amos titled “Marginality and the Heroes Art.” Amos completed a doctorate in anthropology at UCLA in 1983 and was able to do ethnographic field work with Chinese martial artists in both Hong Kong (1976-1980) and Guangzhou (1980-1981) at a time when very few westerners were studying hand combat in mainland China. It should also be noted that this field work was completed shortly after the end of the Cultural Revolution and prior to the explosion of popularity in the martial arts that resulted from Jet Li’s hit film, “The Shaolin Temple,” in 1982. His research is a rare historical witness to an important moment in modern martial arts history. One of Amos’ most important informant in Hong Kong was a local, marginally successful, Southern Mantis master who he referred to as “Master Peng.” Following the standard practice of ethnographers at the time, Amos protected the identities of his informants by using aliases in his publications. During the Lunar New Year’s morning the master’s disciples and kung fu brother arrive at his apartment, they bow and offer incense to the ancestral tablets, the kung fu ancestors, the earth god, and the door god. It is important to show respect to the master’s ancestors and kung fu ancestors at this time of the year, and the smoke from the burning incense hangs thickly in the room, making it difficult to breathe. Master Peng and the members of his kung fu cult believe that the qilin used in their ritual is possessed by the spirit of the qilin. When the materials which make up an old qilin begin to wear, the master and his disciples spend $1,800 H.K. (approx. US $360 in 1979) to purchase a new qilin; and on an appropriate time of the month determined by the Chinese Farmer’s almanac, they bring to life the qilin (which becomes a male or female qilin) in a possession trance ritual which the members of the cult perform deep in the hills of the New Territories in the late hours of night before dawn. During the Lunar New Year rituals, after the qilin music begins everyone but Master Peng puts on ritual garb, and the qilin (with two dancers inside) leaves the martial house first. The qilion is followed by the cymbal player, two boxers carrying the gong on a pole, two bearers of the kung fu ancestral drum, two “protectors” of the qilin carrying seven foot long fighting staffs, one choreographer of the qilin’s movements, one collector of “luck money” (lishi), and the rest of the master’s disciples, relatives and friends who have turned up for the day’s events…. The Hong Kong police have asserted that coercion is frequently involved in the collection of lucky money by lion and qilin dancing teams during the Lunar New Year, and they have stated that members of the kung fu cults sometimes harm or harass storeowners and neighbors who do not contribute money. At every stop of Master Peng’s qilian team, “lucky money” packets were given to the “lucky money” collector. It should be noted, however, that the members of Master Peng’s cult were on their own “territory” in New Market Town, and they collected money only from nearby store owners and neighbors, many of whom are the master’s relatives or friends, who had been informed days in advance by formal visiting cards that the qilin dancing team would be coming. When Master Peng’s qilin team arrived, householders and store owners opened their doors and, for all appearances, warmly welcomed the good blessings of the qilin. The apartment buildings visited by the qilin team were five stories high, and the team worked its way from the lower floors to the upper stories. Inside each apartment the qilin bows three times to the family’s ancestral shrine and then bows to their earth god shrine and door god shrine. In spite of the fact that it has been illegal to possess firecrackers in Hong Kong since the riots of 1966-1967, many families welcome the qilin by lighting strings of firecrackers. Visits by the qilin to private homes lasted approximately five minutes, but dances at shops and stores take longer, and more elaborate dances at these latter places are frequently rewarded with greater sums of money. When the qilin arrives, merchants sometimes hang heads of lettuce stuffed with red “lucky money” packets from the beam of their shop doorways. Lettuce is used for this purpose because in Cantonese lettuce is a homophone for the expression “getting wealthy.” On these occasions, the qilin grasps the head of lettuce, and spits out the “inedible” leaves, while retaining the money packets. Out on the street, the members of the kung fu cult are relaxed and festive. When the qilin appears, small children excitedly run up to it, and members of the cult who are not occupied with the dance play with them. They also throw lighted firecrackers and indulge in some of the paper gambling games which are popular in Hong Kong during the Lunar New Years. During the afternoon of the first day of the Lunar New Years in February 16, 1980, Master Peng’s qilin dancing team by chance encountered another kung fu cult’s lion dance team. Members of both cults became tense and serious; according to custom, if either the lion or the qilin are not polite when they meet, members of the slighted kung fu cult will take offense and fight with members of the cult who have insulted them. The qilin and the lion took fifteen minutes to greet one another before they danced down the street to their next stop. When Master Peng’s qilin dancing team returned to the martial house at dusk, everyone complained that the master of the lion dance team had been stupid and impolite to collect “lucky money” on their territory without first consulting Master Peng. One of the master’s senior disciples explained that the other cult’s lion dancing team had not intended to insult Master Peng; they had simply been foolish in trying to collect “lucky money” in an area outside their base without checking to see if another kung fu cult had prior claim over the territory. Qing era Qilin at the New Imperial Summer Palace. By the early Qing this creature seems to have assumed its final form. Source: Wikimedia. More details of local Lion and Qilin dancing are available in Amos’ dissertation. Still, the excerpts above conveys a good sense of how modern martial arts schools and communities have experienced this ritual. The connections to folk religion and spirit possession practices outlined by Amos during the initiation of a new Qilin are among the most interesting parts of this account. He provides additional ethnographic accounts of trance possession among other martial artists in Hong Kong in a later case study in the same dissertation, but they are beyond the scope of the current post. In southern China, Qilin dancing was almost always associated with the Hakka ethnic minority. This made it relatively uncommon (compared to the Lion dance) outside of the East River basin. Recently efforts have been made to “save” the practice. In typical fashion this salvation has been imagined in terms of standardization, modernization and the creation of new qilin dancing competitions. All of this seems oddly reminiscent of earlier attempts to “save” the traditional Chinese martial arts by rationalizing and modernizing them so that they too could be transformed into a widely accepted sanitized public sport. Qilin dancing does appear to be on the rise, so possibly this strategy will pay off. I was very happy to see that the latest issue of Kung Fu Tai Chi Magazine (March/April 2013) even features a very well done article on the subject by Willy Pang. The photography in that piece is beautiful and it is well worth checking out. Nevertheless, Amos’ account of an earlier, more esoteric and organic, form of the art is a valuable historic document. It also opens a wonderful window into the inner-life of a traditional Southern martial arts school in Hong Kong in the late 1970s. In fact, his whole dissertation is worth checking out. A couple of chapters from it were later published as articles in Journal of Asian Martial Arts, but its not clear whether back issues will be available to readers in the future now that the publication has shut its doors. The original dissertation is full of detailed observations and should get much more attention than it has so far received. Three Qilin heads. 2006 Monkey God festival in Hong Kong. Photo credit: Sam Judkins.